Thanks to a new trend in playground design, older Americans are joining their grandkids on the playground and keeping “playtime” going strong well into their golden years. Think about it: Most of the time, grandparents can be found sitting on the benches off to the side while the kids have all the fun. A play space that gets young and old active and involved means everyone gets in on the action. Sounds like a great idea, right? A recent article in GOVERNING, an online publication which covers state and local government policy issues, says we’ll soon be seeing more playgrounds “where aging adults can participate alongside their children or grandchildren.” The article says outdoor activity spaces designed specifically for older people have become popular in Asia and Europe, whereas in the U.S., the approach seems to provide a shared play space where the young and old can be active and involved together. Playgrounds designed specifically for the young might include monkey bars, seesaws, slides, and jungle gyms for the kids. For the older folks, you’ll see low-impact exercise equipment such as elliptical machines, stationary bikes, and resistance equipment that can build strength. (Note: as we’ve talked about before, it’s important that adults stay off the equipment that’s intended for kids!) You’ll also find walking paths that encourage cardio-friendly strolls with the kids. 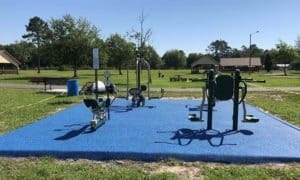 In other words, “age-integrated play” usually includes fitness stations aimed at people 60 and older near the children’s area or along walking paths nearby. We’re not talking weight benches among the monkey bars—the idea isn’t to turn grandpa into The Rock! So what is the goal? As we’ll see, the benefits can be enormous. Exercise is one of the foundations of a long healthy life, and for seniors it can literally save their lives. Seniors are at high risk for serious falls. Each year, more than one-third of people age 65 or older fall. Many of them suffer moderate to severe injuries (such as hip fractures) that increase the possibility of a shorter lifespan. Any exercise that sharpens reflexes, increases muscle strength, and improves flexibility can help prevent falls and related injuries. Since a fall can be physically and emotionally devastating for seniors, improving balance is crucial. Although recommend that the aging continue with activities that help develop their balance and maintain strength, falls cannot always be prevented. That is why it is so important to have a shock-absorbing and slip resistant surface like our No Fault Safety Surface covering the fitness area. Large muscles support a person’s posture, contribute to the body’s metabolism, and can even minimize injuries in the event of a fall, so developing those muscles is important at any age. The physical benefits include everyday benefits, too. Some outdoor fitness equipment can improve manual dexterity, making it easier for older folks to tie their shoes or open jars. It can help them increase their range of motion, making it easier to perform routine activities, like bending down and picking up objects they have dropped. Sure, older men and women need to stay active for their bodies’ sake, but they also need it for their social and mental health. Physical activity can increase confidence in older adults, giving them more control over their lives. Getting this activity in the fresh air and sunshine is better than doing it indoors, too. Indoor gyms are not a bad idea, but sometimes seniors get discouraged when the gym is overcrowded by younger people who are more advanced in their workouts. The “no pressure” approach of outdoor exercise lets them approach fitness at their own pace. Finally, combining fitness time with playtime for the little ones means spending quality time with the children in their lives. Good health and quality time with family—what could be more important? Incorporating exercise equipment for seniors in your traditional playground design is a great way to help seniors set the example for a healthy, active lifestyle. It’s also a great way to encourage multigenerational play and quality time together outdoors. Wherever adults and children gather to play, they are going to need a smooth, seamless, and slip-resistant surface like our No Fault Safety Surface. It’s ASTM F-1292 compliant, ADA approved for outdoor applications, and proven to provide fall protection up to 12 feet. 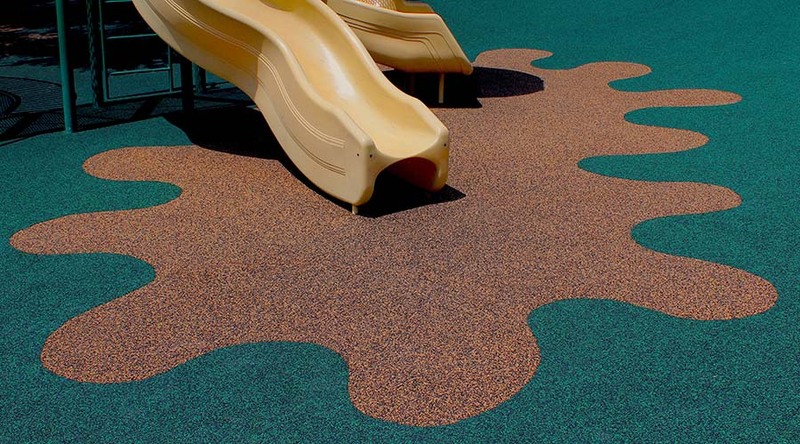 Contact us today to learn how No Fault products can improve the appearance and safety of playgrounds for all ages.